When we wrote the attached press release on June 25, we had high hopes and expectations for a very successful Canoe the Heart of the Continent Expedition. The success of this voyage cannot be measured by the more than 350 miles paddled and portaged, but rather by the number of people we reached along the route with our message of celebration and collaboration. From the amazing Canada Day Parade in Atikokan, to the International Falls Fourth of July Parade, to the very large Crane Lake event at Voyagaire Lodge, on to the excellent Fall Lake celebration with U.S. Forest Service regional forester Kent Connaughton in attendance, and departing on July 10 from the Moose Lake Scout camp with youthful enthusiasm, the first half of the trip was extraordinary. It only got better. We were overwhelmed by the attendance at the newly remodeled Chik-Wauk Lodge at the end of the Gunflint Trail,and the bagpipe reception and traditional dinner at Grand Portage National Monument. The expedition culminated with a Grand Reception and Celebration at Historic Fort William in Thunder Bay. The cannons and muskets blasting a welcome will never be forgotten! We estimate that well over 10,000 people witnessed the Centennial Canoe and our Heart of the Continent message. That’s not to mention the approximately 60 paddlers who took a turn paddling the canoe and forged the important relationships which will promote the type of positive collaboration this landscape deserves. My sincere thank you to the many people that worked so hard on this event! In addition, thank you to the Quetico Foundation for purchasing and supplying the 27 – foot voyageur “north” canoe. My special thanks to Lisa Radosevich Pattni, U.S. Forest Service, who believed in the original dream and made it a reality, Greg Seitz, Friends of the Boundary Waters Wilderness, for countless hours posting the trip journals and pictures and, John Craig, Chef Extraordinaire, who paddled every single stroke and cooked every single trail meal of the “Canoe the Heart” Voyage! My sincere thank you to all! 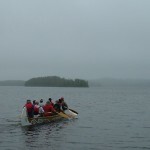 Participants in the expedition will crew a 27-foot voyageur canoe along a +350 – mile (+563 – kilometer) route that begins in Atikokan, Ontario and continues on to Fort Frances then follows the border through Voyageurs National Park, Minnesota into Superior National Forest at Crane Lake, through Ely, and onwards to Grand Marais, then along the Lake Superior shore to Grand Portage, ending at Fort Williams in Thunder Bay, Ontario. Unlike the early voyageurs, participants will not have to carry 100-pound stacks of furs, but they will carry educational messages regarding Leave No Trace principles and non-native invasive species to deliver to those they meet along the way. The Voyageur Canoe has been rendered with Artistic images of Invasive species! The expedition is being sponsored by the Heart of the Continent Partnership – a Canadian/ American coalition of land managers and local stakeholders working together on cross-border projects that promote the economic, cultural and natural health of the lakes, forests and communities in the Ontario/Minnesota border region. It is the expectation of the Partnership that this centennial voyage will bring together new and existing partners in such a way as to expand and deepen relations to benefit public lands. To further this end, public events are being planned in local communities at points along the route, including Atikokan, International Falls, Crane Lake, Ely, Gunflint Trail, Grand Marais, Grand Portage, Fort Williams, and Thunder Bay.